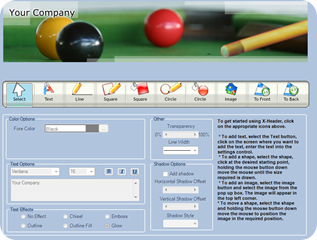 This is a utility to create banners which could be used on websites and newsletters. Created and offered by Paul Smithson, the same person that offers XSitePro and XMailPro. Basically this is a graphics package with a ton of included banner samples that are pre-sized (750 x 150) for a webpage. As a graphics package it is pretty basic. It offers simple (by today’s standards) manipulation of text and graphic objects. Most of the effects are not real-time preview; in other words you have to make the change and apply it before you see what the effect will really look like. Another example is the object’s order in the stack. You can click a “send to back” or “bring to front button”, but there is no way to nudge an object back or forward – it’s all or nothing.